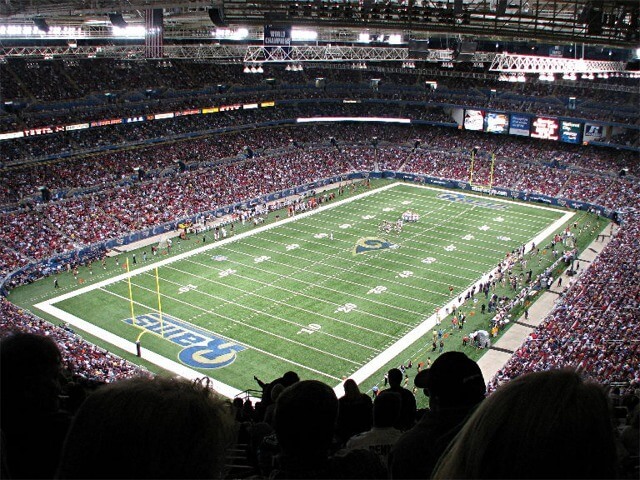 The Edward Jones Dome (more formally known as the Edward Jones Dome at America’s Center, and previously known as The Trans World Dome (from 1995 to 2001) is a multi-purpose stadium in St. Louis, Missouri, and home of the St. Louis Rams of the NFL. It was constructed largely to lure an NFL team back to St. Louis, and to serve as a convention center. The Dome provides multiple stadium configurations that can seat up to 70,000 people. Seating levels include: a private luxury suite level with 120 suites, a private club seat and luxury suite level with 6,400 club seats, a concourse level (lower bowl) and terrace level (upper bowl). The dome was completed in 1995.